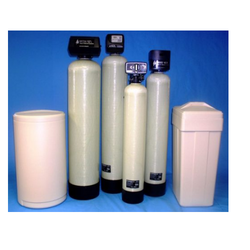 We are engaged in offering our clients with Water Softeners that is available in different models and sizes at market. Offered water softeners are fabricated by making use of qualitative raw material that is sourced from the most valued vendors of the industry. Moreover, we offer these water softeners in various technical specifications at highly competitive prices. Owing to our expert team of technicians, we are market leading manufacturer, supplier and exporter of Water Softeners. These pumps are fabricated using latest technology and modern tools at our technologically advanced infrastructure by a team of expert professionals. Water softener reduces the ion concentration level of calcium or magnesium in hard water. This is the most common and easiest method of removing hardness from water and turns the water suitable for other resourceful purposes. Customers can avail these qualitative pumps from us at competitive prices.